We have a vegetarian in the family, so I cook most of our evening meals meatless. This is not at all painful, with today’s food options. But, let’s get real — there is nothing like a family vegetarian to make a side of cow into the holy grail. So, when the said loved one was not home for dinner on a recent Friday night, hubby and I pushed the speed limit (“pushed”, not “exceeded”) to reach Acton’s Red Raven Gastropub. The name screams “British,” and we all know the Brits never met an animal they couldn’t cook, or tried to. Jeff and I heard mixed reviews of this place since it opened late last year, taking over the space of the former Scupper Jack’s. But, given how un-memorable those meals were, we knew anything could be a step up. It was. Still, this move was really brave, I daresay. Those reviews included tales of food poisoning, arrogant servers, sticky glasses. But, after our visit, my initial impression is these potholes—unlike the ones on 117—are gone. Walking in, there’s no doubt the homey Scupper Jack’s decor has gone upscale British. While it is not a dressy place (the servers wear plaid shirts), be warned that the dark wood and crisp, white tablecloths can be intimidating. However, a glance at the very, very busy bar area on a Friday night didn’t turn up any foo-foo Jimmy Choos. Looking at the menu, Jeff noted a list of “a gazillion” beers, likely the siren call from the bar to all those high-tech workers from the local office parks. Before we proceed, be cautioned that the prices are more in line with the rich décor than with the diners’ jeans — but you get what you pay for. Appetizers begin at $3 (Homemade Sea Salt & Vinegar Chips) and range through 12 more selections you and your family and friends could build a tapas meal around. Do NOT look for onion rings or nachos; that’s not why you’ll be there. There are House Bacon Dripping Hush Puppies, even a build-your-own cheese board. We chose the Baked Raclette ($9), described as “a classic Swiss fondue”. Actually, it was not, insofar as there were no pokers for dipping. Instead, it was a rich, wondrous dip served with toasted baguette pieces for mopping it up. For dinner on this cold evening, I would have normally ordered the Grilled Cheese and Roasted Tomato Soup, but was on the hunt for meat. Also, at $11 … well, I’m opposed to paying double digits for something mom would whip up. But seriously, rumor has it that this sandwich — which includes arugula, Nashoba Brook Bakery brioche, and goat cheese — is a top choice. Instead, I was seduced by the cleverly named Quoth the Burger…Nevermore. While the ingredients – tomato jam, pickled onion, cheddar, and such — were gourmet, this was as satisfying a burger experience as you would get with more common toppings. It was juicy, it was delicious, it had yellow mayonnaise on the side that did not come from my fridge. And the slightly seasoned fries accompanying it were fabulous—so good, that when the server asked if I wanted ketchup, I think I looked at her funny. I left there stuffed, probably because I threw in the cured bacon as an extra. You also can get egg on that burger. Jeff’s take on the Raven Flatbread ($11) is more mysterious. This was a full plate of flatbread topped with confit chicken, roasted figs, goat cheese, red onion, etc. It looked like a salad on a sandwich, something I would happily order on a day when cows weren’t mooing my name. But, he simply called it “very good”, which usually means “excellent” for commoners, so take that interpretation and run with it. He was a bit put off by the newspaper under the food (as in, fish and chips wrapped in paper, as they do across the pond). Some of this clung to his food, which naturally irritated my honey. Otherwise, don’t expect the pizzas, pastas, and wraps of American casual dining, certainly not in a place that offers a bone-in rib eye at $39. 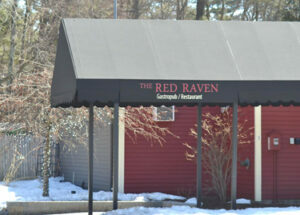 The Red Raven is different, and proud of it.